If you are like most people, you may have put off a few years of retirement savings when you were younger. Perhaps the cost of raising children took precedence over retirement savings. Daycare can cost as much as a mortgage payment, and college tuition is astronomical. Perhaps you withdrew funds from your 401(k) to start a business. There are a host of other reasons to take money from your retirement account or reduce your savings rate; a down payment on a home, medical expenses, or simply surviving a period of unemployment. Whatever the reason, many people find themselves playing catch-up in the years leading up to retirement. This is where retirement catch-up contributions come in to play. Beginning in the year you turn 50, the IRS allows you to make additional contributions to IRAs, ROTH IRAs, 401(k)s, and other retirement plans. As long as you turn 50 before the end of the calendar year, you are eligible to make catch-up contributions. Catch-up contributions are great because they allow for more savings, more income deferral, and, hopefully, higher balances at retirement. Source: IRS Catch-up contributions for 2019. Let’s take a look at the impact of making catch-up contributions. 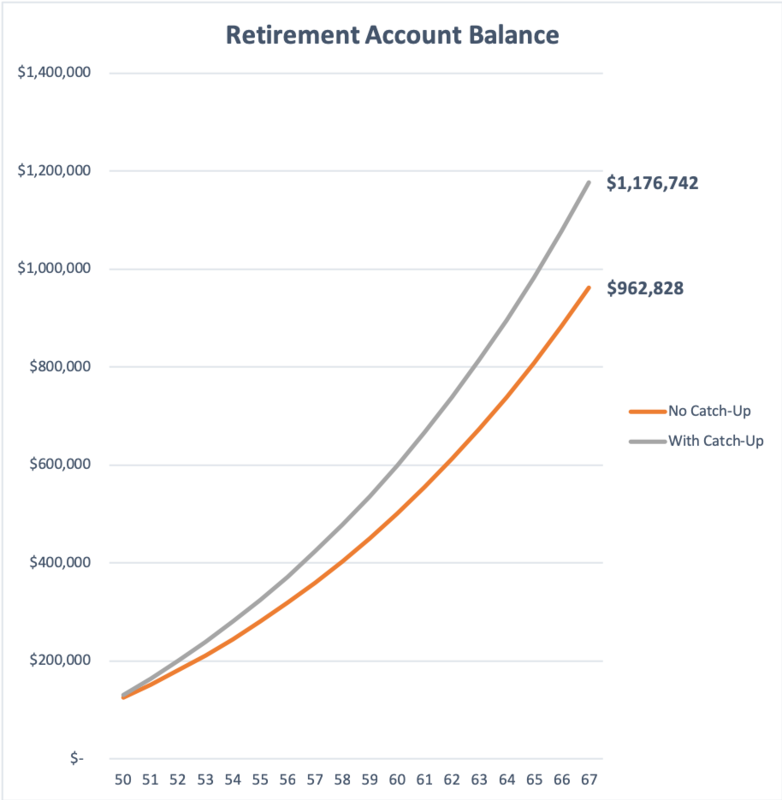 The chart below shows a retirement account balance for an individual saving the max with no catch-up versus one saving the max plus a catch-up contribution. At age 50, this individual had $100,000 in a 401(k), not enough to fund a 30-year retirement. The Full Retirement Age for someone age 50, according to Social Security, is age 67, so they will save for 17 additional years. This assumes the average rate of return is 6% per year and that contribution limits increase by 2% per year. The difference in the retirement account balance is $213,900, which required $128,500 in additional contributions. If you are turning 50 in 2019, don’t forget about this helpful gift from the IRS. Even those with birthdays late in the year are eligible to make a full catch-up contribution. I have heard that the AARP adds you to their mailing list at age 50, which is ridiculous. It would be nice if the IRS sent a reminder to all savers age 50 and older. Your 50s can be prime earning years when the expense of raising kids is finally in the rear view mirror. Take advantage of your ability to save a little more between now and retirement. What if Your Goal Isn’t the Max?